A mule is the offspring of a male donkey (Jack) and arnfemale horse (Mare). Mules can be lightweight, medium weight, or when producedrnfrom draft horse mares, of moderately heavy weight. 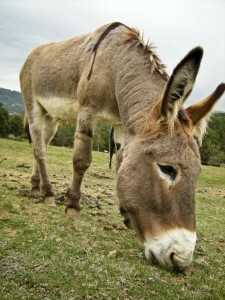 Mules are more patient, hardy,rnand long-lived than horses, and are less obstinate and more intelligent thanrndonkeys.